Angry Birds Game ကို ဂိမ္းနည္းနည္းေလး ကစားသူေတြေတာင္ သိၾကပါတယ္.. အရုင္ကေတာ့ ဝက္ေတြကို သာမန္အစြမ္းေလာက္သာရွိတဲ့ ငွက္ေတြနဲ႔ တိုက္ခိုက္ရေပမယ့္ ခု ဒီ Angry Birds Transformers မွာေတာ့ Angry Birds ေတြဟာ စက္ရုပ္အျဖစ္ ကစားရမွာျဖစ္ပါတယ္.. အျမင္သစ္၊ စြမ္းအားအသစ္ေတြနဲ႔ Angry Birds Transformers ေနာက္ဆံုးထြက္ 1.5.16 ကို ပိုက္ဆံ အျပည့္အဝ ခိုးျပီးသားရလာလို႔ တင္ေပးလိုက္ပါတယ္.. Data ကိုျဖည္ၿပီး SDCARD/Android/Obb ေအာက္ကို ထည့္ေပးရပါမယ္.. 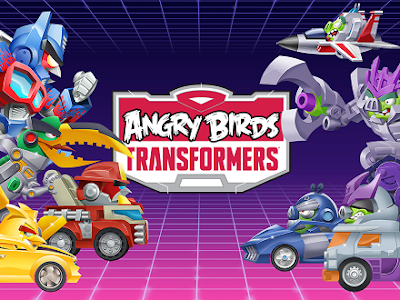 Angry Birds and Transformers collide in this action-packed, 3D shoot ‘em up adventure! The EggSpark has transformed the eggs into crazed robots who are destroying Piggy Island, but who can stop them?! Autobirds, ROLL OUT! Have you ever seen an alien robot Angry Bird? Enter the AUTOBIRDS! This brave band of heroes features Red as Optimus Prime, Chuck as Bumblebee and… well you’ll meet the rest soon. They’ve got lasers and they turn into cars. Plus they have arms and legs – that’s a first! But the courageous Autobirds can’t save Piggy Island on their own – to stop the EggBots they’ll need to join forces with their arch rivals the DECEPTIHOGS (like Decepticons only smellier). Some new levels are added.